The presence of God was powerfully felt all through the service as the man of God continued to minister healing and deliverance to congregants from different parts of the world. Prophet T.B. Joshua engaged the minds of congregants with a thought-provoking message, LET THE HOLY SPIRIT REMAIN, centred around the incomprehensible ways of God. “God does not give us what we know how to do,” he said, adding that He gives us what we don’t know how to do so that He would teach us how to do it. According to the man of God, whenever God wants to teach us how to do a thing, he reforms and refines us just as gold passes through the furnace. During the mass prayer with Prophet T.B. Joshua, many demonic chains were broken as age-old yokes were broken in the mighty name of Jesus Christ. Prophet T.B. Joshua moved round the auditorium with so much power that even people seated at a distance, fell under the influence of the Holy Spirit, manifesting and vomiting all forms of poisonous substances. Suffering from evil attacks, Ms Chantal Bridget Nyemeck from Cameroon had also discovered a strange movement in her stomach. For some time, she had been seeing herself eating and drinking in her dreams, encountering dead people, including her late husband. She also had a spiritual husband. Her constant torment drove her to take the journey to her neighbouring country Nigeria to visit The SCOAN in search of deliverance. She was further encouraged by a dream in which she had an encounter with Prophet T.B. Joshua. According to her, in her dream, the man of God placed her in water and said, “Be cleansed!”. Penultimate Sunday, she was in the auditorium as Prophet T.B. Joshua ministered spirit filled prayer and deliverance to congregants, in Jesus’ name. During that Mass Prayer, she had prayed for God to locate her. As the prayer intensified, Ms Nyemeck felt the movement of God’s power in her stomach. Suddenly, she started vomiting vile smelling poisonous substances, including a whole cockroach. As soon as she vomited the cockroach, all the movements in her stomach suddenly stopped.Testifying last Sunday, she told congregants that all the nightmares, eating and seeing dead people in her dreams had stopped. According to her, her sleep is now very peaceful. She advised people all over the world to trust God and have faith in Him, no matter how long it takes. 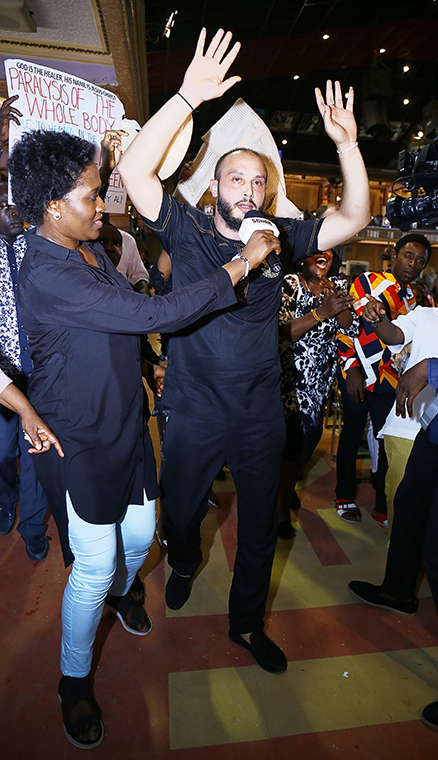 Mr Mohammed from Lebanon came to The SCOAN with the problem of paralysis of the whole body. Since 2008, the condition had lingered, making him incapable of engaging productively in his business. He could not go to work and even when he tried to sleep, he would experience serious pain and discomfort. Despite the fact that he had been to different hospitals, there was no solution and the problem continued to worsen. The Doctors only suggestion was surgery. 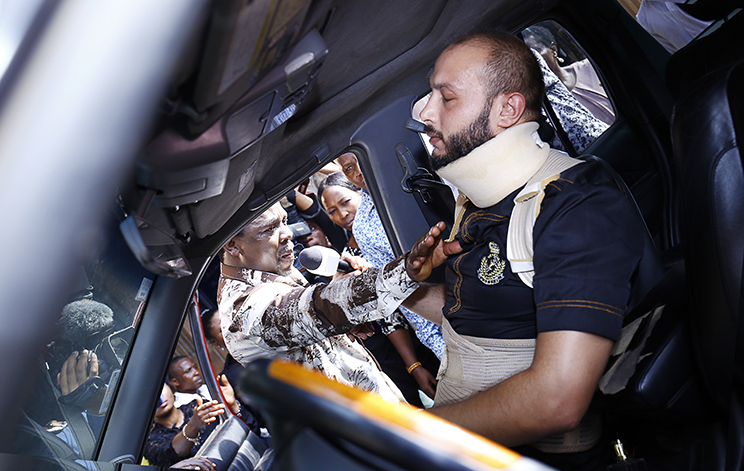 Unable to move, Mr Mohamed was brought to The SCOAN in a car, wearing a body brace and neck collar. Prophet T.B. Joshua came outside to where Mr Mohammed’s car was parked to attend to him right inside the car. According to Mr Mohammed, as soon as the man of God touched him, he felt something come out of him and immediately he stood up to walk for the first time in nine years! Sounding jubilant and radiating a sense of gratitude to God, Mr Mohammed recalled, during his testimony, how he lived daily on medication just to make it through the day. His friend, who came to testify with him, told congregants how Mr Mohammed was introduced to Emmanuel TV and how he decided to seek the face of God. Mr Mohammed has experienced the hand of God through Christ Jesus. Demonstrating his new-found fitness to the glory of God, he advised people all over the world to run to Jesus ­­­whenever they have problems. Lance Corporal Anthony was involved in an accident while serving with the Nigerian army in the north-eastern part of the country – a known area where terrorists operate. The accident left him with a fractured femur which necessitated an operation in which iron was inserted into the affected bone to enable him to walk. Despite the operation, he found it extremely difficult to walk without aid. Aside the crutch which he used, he largely depended on other people for locomotion. Instead of Lance Corporal Anthony’s condition to improve, it gradually got worse. After the submission of the hospital hit him with a bang of hopelessness, the young soldier decided to go spiritual. He had been hearing about The SCOAN and had witnessed many wonderful miracles on Emmanuel TV, and so, there is hope at the end of the tunnel after all. Mustering some faith-inspired strength, Corporal Anthony visited the Arena of Liberty last Sunday. During the service, Prophet T.B. Joshua ministered prayer and deliverance to congregants in a most tensed manner. The atmosphere was charged with the ubiquitous power of God. Many were let loose from the grip of demons and evil spirits while others were healed of age-long infirmities. As the man of God moved from one direction to the other, Corporal Anthony could feel the presence of God even from far away. When the man of God eventually got to his position and touched him, he lost touch of the reality around him and landed on the floor. By the time he regained consciousness, he was overtaken by freight and had wanted to run away. It took the intervention of the evangelists for him to realise that he had just been healed. Rather than run away, they advised him to walk in the glory of God’s power, having been healed of an ailment that defied medical logic. Since that moment, Lance Corporal Anthony has not used a crutch. He walks without aid after the Holy Spirit had operated upon his fractured femur, transforming it into a brand-new one. 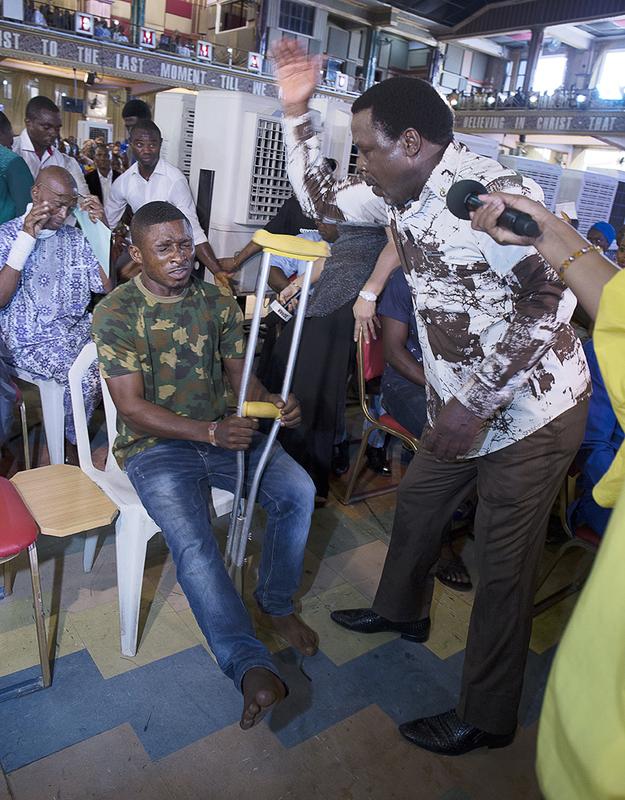 Demonstrating his fitness with vigour and agility during his testimonies, he told congregants that the crutches were no more useful to him. “I will throw them away,” he added. Mrs Chinyere Obichukwu came to The SCOAN with three serious problems. She had been suffering from barrenness due to bleeding caused by fibroid. She also had a kidney disease. The combination of those problems made life very miserable for her. As a banker, the bleeding almost rendered her inefficient in her work place. She would have to visit the convenience so many times in a day. As for the kidney problem, it made her uncomfortable most times. She felt sharp pains in her upper abdominal regions. Coming to The SCOAN last Sunday, Mrs Obichukwu was bleeding profusely, prompting her to visit the convenience many times to change. 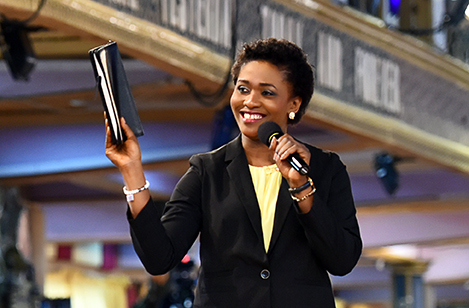 But as soon as the man of God started moving around the auditorium, she started feeling the powerful presence of God even before he got to her position. She had been inspired faith-wise by the testimony of a woman who was healed of cancer. She continued to pray while the man of God ministered healing and deliverance to congregants. By the time the anointed touch of Prophet T.B. Joshua landed on her, she felt a strange yet powerful impact. By the time she returned to the convenience to check herself, she discovered that the bleeding had stopped. Thereafter, the pains in her abdomen also ceased – an indication that the kidney disease was no more. Testifying, the elated woman based in Kaduna State, Nigeria, also declared that she would soon come to testify about her forthcoming baby. 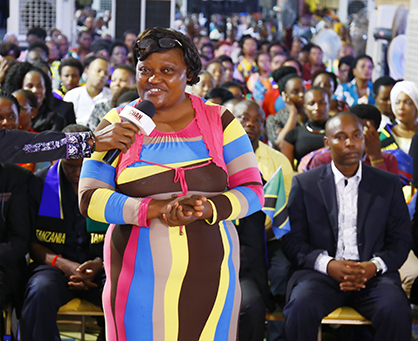 Mrs Obichukwu came to The SCOAN with serious problems but has since returned to her home completely healed and full of songs of praise to God. “Believing is your connection. People of God, do not give up. Soldier on!” she advised. Mr Charles Ude had suffered from the problem of difficulty in walking. The problem saw him undergo a corrective surgery on his back after which his doctors explained that he needed two more surgeries. The Nigerian living in South Africa experienced tough times as he was almost unable to do anything by himself and as his entire lower abdomen had gone numb and virtually dead to every sensory feeling. At a point, he was also given certain social considerations as a disabled person. His condition made him consume different doses of medication daily. Rather than wait to undergo the two remaining surgeries, he summoned enough faith and decided to seek God’s help at The SCOAN. Penultimate Sunday, he was one of the congregants that attended the church service. During Mass Prayer, he cried out to God to help him as Prophet T.B. Joshua ministered prayer and deliverance to congregants from different nations of the world. 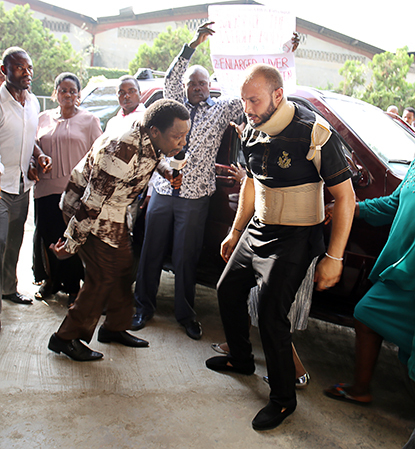 Adorning a lumbar corset and knee brace, Mr Ude’s leg vibrated as the man of God unleashed God’s power on it. He was thereafter ordered to rise up and walk by the man of God after his leg and body were restored to normal once again, no longer in need of the lumbar corset and knee brace. Obeying that prophetic directive, Mr Ude sprang to his feet, walking unaided for the first time in a long while. His miraculous healing was accompanied by shouts of “Thank You, Jesus!” by himself and members of the congregation. During his testimony last Sunday, Mr Ude told congregants how he suffered untold hardship as a result of his difficulty in walking. According to him, even his career was seriously threatened by the problem. He also recounted how his pastor in the United States had discouraged him from ministering the Morning Water. His pastor’s discouragement would soon prove to be unfounded after they had tried to burn the Morning Water. But instead of burn with the fire, the anointed medium moved like a spirit and left them gapping in awe. “Whatever your problem, your solution is in the hands of God,” he advised. This entry was posted in Featured Articles on April 5, 2017 by TB Joshua Fans UK Blog.